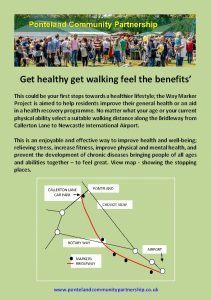 This could be your first steps towards a healthier lifestyle, the Way Markers Project aimed to help residents improve their general health or as an aid in a health recovery programme. 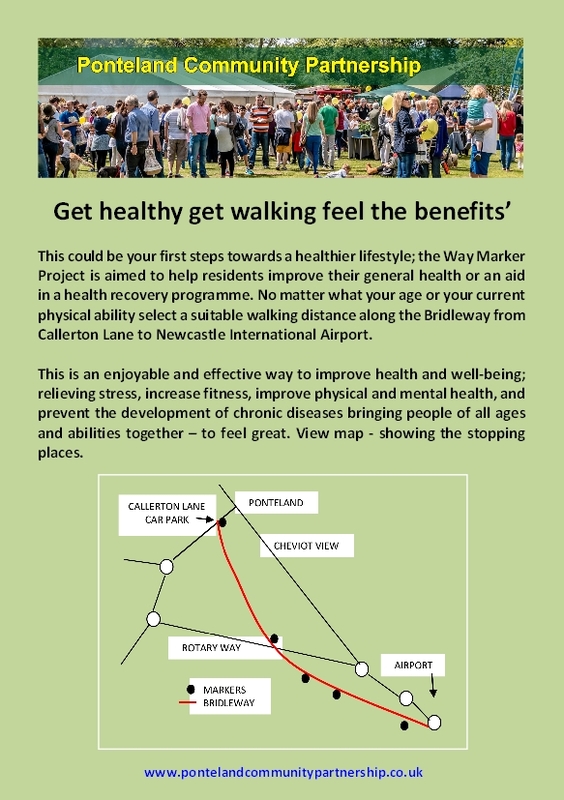 No matter what your age or your current physical ability, select a suitable walking distance along the bridleway from Callerton Lane to Newcastle International Airport. Take a friend and your mobile phone. This is an enjoyable and effective way to improve health and well-being; to relieve stress, increase fitness, improve physical and mental health, and prevent the development of chronic diseases bringing people of all ages and abilities together – to feel great. 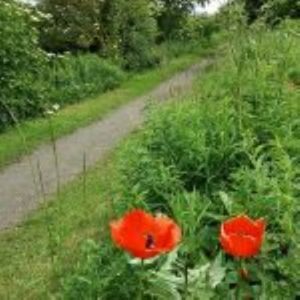 The Way Markers Project is linked into the revamped bridleway and has been undertaken by the Ponteland Community Partnership supported by the Community Foundation “Out and About” fund and Northumberland County Councils “Ageing Well Strategy”. 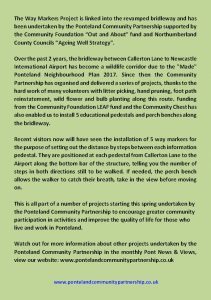 Over the past 2 years, the bridleway between Callerton Lane to Newcastle International Airport has become a wildlife corridor due to the “Made” Ponteland Neighbourhood Plan 2017. 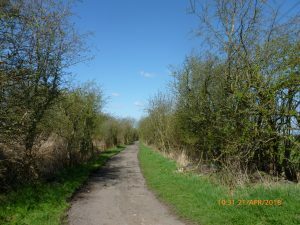 Since then the Community Partnership has organised and delivered a series of projects, thanks to the hard work of many volunteers with litter picking, hand pruning, foot path reinstatement, and wild flowers and bulb planting along this route. Funding from the Community Foundation LEAF fund and the Community Chest has also enabled the Ponteland Community Partnership to install 5 educational pedestals and perch benches along the bridleway. Recent visitors will now have seen the installation of 5 way markers for the purpose of setting out the distance by steps between each information pedestal. They are positioned at each pedestal from Callerton Lane to the Airport along the bottom bar of the structure, telling you the number of steps in both directions still to be walked. If needed, the perch bench allows the walker to catch their breath, take in the view before moving on. 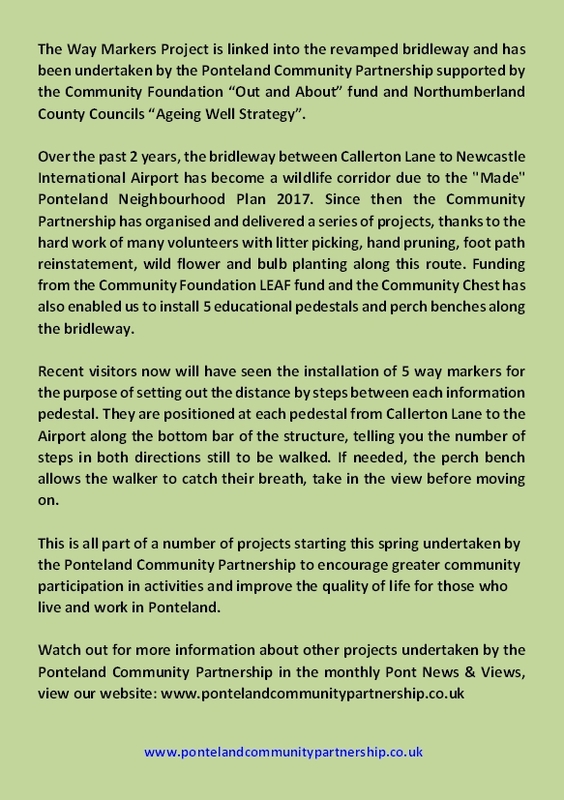 This is all part of a number of projects starting this spring undertaken by the Ponteland Community Partnership to encourage greater community participation in activities and improve the quality of life for those who live and work in Ponteland. 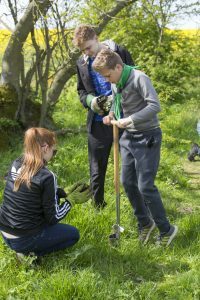 The Community Partnership thank all the young people who volunteered on a 3 stage event planting wild daffodils, snowdrops and wild primroses during late September and October. 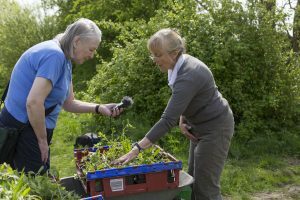 The bulbs were planted from the Airport end of the bridleway towards the village; in total they planted well over 1,100 bulbs and 300 primroses starting on the 29th September when the Air Cadets volunteered to start the planting. 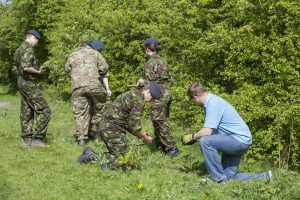 This was followed on the 6th October with the return of the Air Cadets who were joined by the Scouts and Explorer Scouts continuing the planting up to Rotary Way. 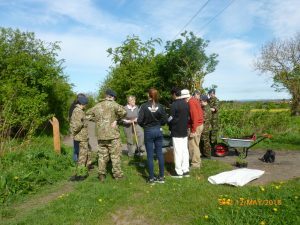 By assisting in this way the Air Cadets are contributing towards their Participation In Public Events award and the Scouts & Explorer Scouts can use this experience for the Duke of Edinburgh Gold & Platinum award. Due to bad weather the event on the 13th October had to be cancelled but willing hands on the 16th & 17th October planted more of the bulbs; leaving the remainder of the plants and bulbs to be planted with a litter pick on the 20th October. 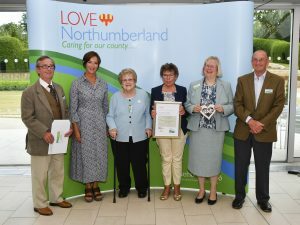 Funding was raised through the Northumberland County Council Community Chest and from Cllr Eileen Armstrong member’s small scheme allowance. All wild bulbs and primroses were sourced from Habitataid they are part of a community of small specialist growers linked to a number of specialist science based UK charities. Habitataid donate half the profits from online retail sales to the “Bubble Bee Conservation Trust”. This recent planting has all been part of a 2 year programme of events to reinstate and improve the environment along the bridleway up to the Airport, which was an old railway track and now a wildlife corridor. All the trees planted last year, wild flower seeds and now the wild bulbs will all help to encourage birds, insects and small mammals to increase in number by providing suitable food required and a safe area for breeding. 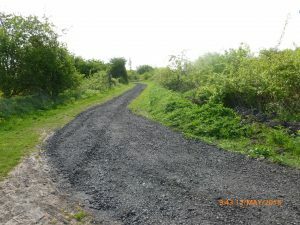 The Callerton Lane part of the bridleway has been avoided due to the imminent building of the Schools Leisure Complex however the Community Partnership is already planning this area for a future project working with NCC and the developer in the soft landscaping reinstatement in around 2020. 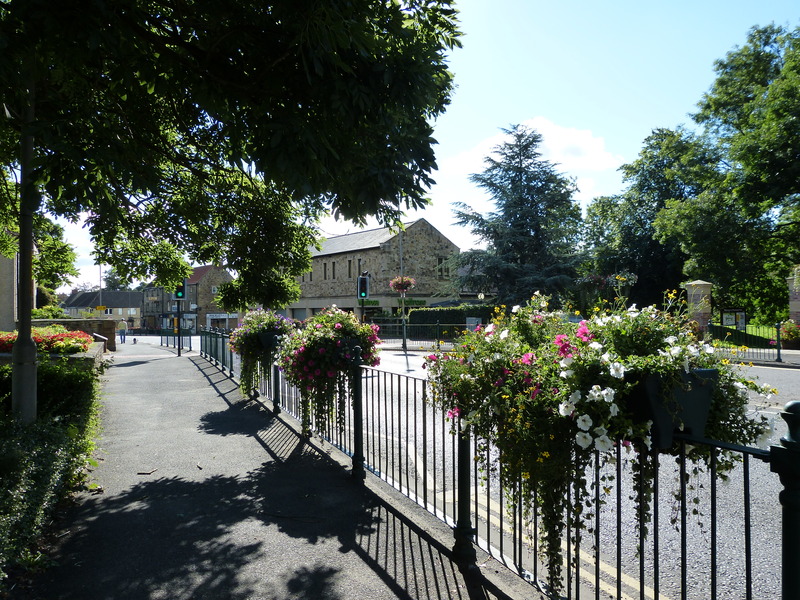 The Ponteland Community Partnership welcomes three former members of the neighbourhood plan steering group onto the committee to work as a discrete subgroup to identify suitable projects for the future. 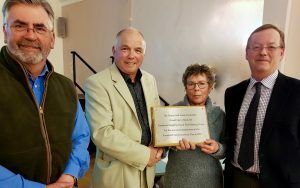 Guy Opperman MP takes time out to support the next steps and projects from the plan and Darras Hall Estates Committee recognise the contribution made by volunteers. The neighbourhood plan document includes 32 planning policies all prepared from community consultations over a 5 year period, throughout this time residents recommended valuable contributions which in turn shaped the final document. Some items could not be included in the plan as they were not within its scope; however some of these were selected as “future community actions” and were attached in the plan as an appendix to be considered by other organisations. It is this section and other ideas from the supportive text in the plan which this new subgroup will be considering later as projects. 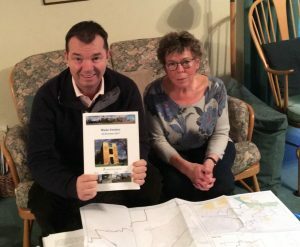 The Community Partnership chairman Alma Dunigan met with Guy Opperman recently to update him on how the “made neighbourhood plan” is to be used by their group in identifying future projects. 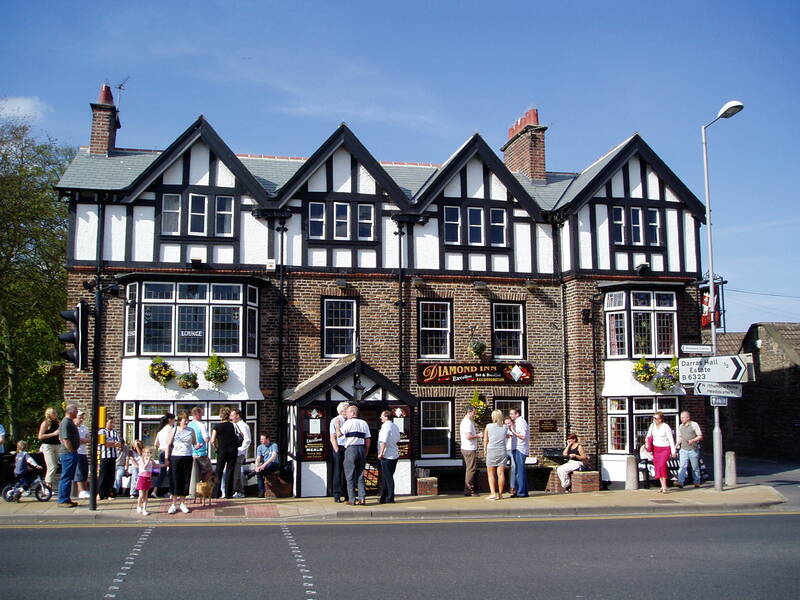 Ponteland will maintain its identity as a sustainable, thriving community, accessible to people of all ages. A gateway to Northumberland, which values its rural setting, rich heritage, natural environment and open spaces. It will remain visually distinct and separate from the Newcastle/Tyneside conurbation, meeting the needs of the local population, without compromising this distinction. 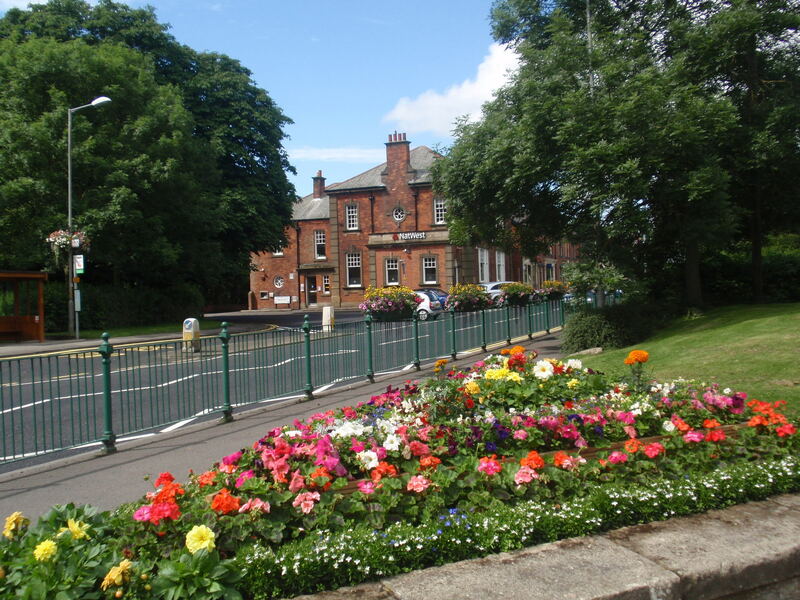 The special identities of Darras Hall, the historic core of Ponteland village and the small settlements in the Parish will be maintained and enhanced for future generations, making the Parish of Ponteland a desirable place to live, work and visit. Chris Winks, representing the Village. Councillor Peter Jackson, representing the rural district. Alma Dunigan, representing Darras Hall. The Ponteland Neighbourhood Plan contains a planning policy, PNP 4, covering some of the unique features of the Darras Hall Trust Deed which now will be used by Northumberland County Council when considering any planning application within the Estate. Darras Hall properties need to comply with the Bylaws and all applications need covenant consent by the Darras Hall Estate Committee as well as planning approval from Northumberland County Council. 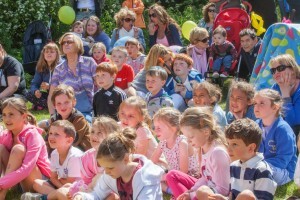 The community partnership was set up in 2003 to identify the things that really matter to people of all ages who live and work in Ponteland Civil Parish which could and would improve their quality of life. To achieve these aims we intend to involve the community, businesses, local organisations and the Town Council in creating meaningful realistic projects which would be funded by a variety of sources. The community partnership shares the vision of the Neighbourhood Plan and supports the community aspirations for Ponteland in the future. 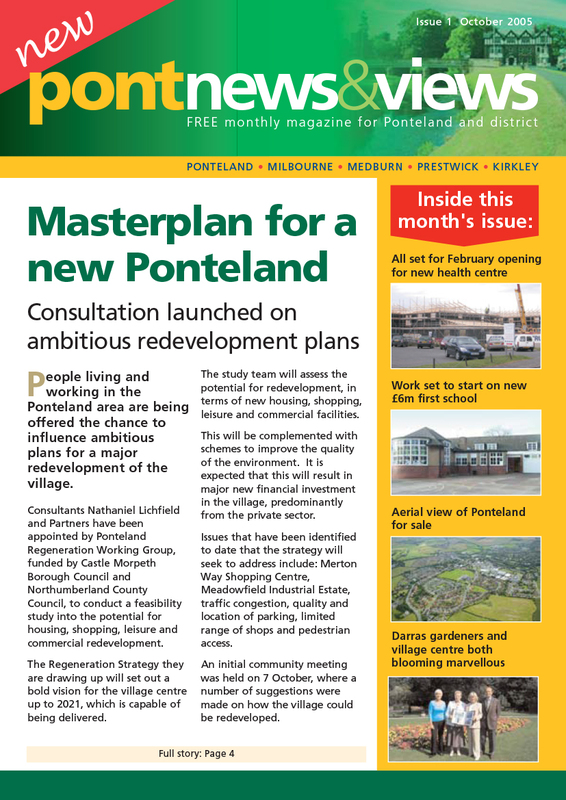 To keep up to date with our progress please view the Pont News & Views, which is delivered to you free of charge. We would welcome your ideas for new projects that would benefit the ‘quality of life in the Civil parish of Ponteland’ if you have any ideas please use our contact page to get in touch or come to our monthly meetings on the third Wednesday of every month, except December, at the Town Council Offices at Meadowfield Court (opposite the Medical Centre), Meadowfield Estate. What is a Community Partnership? Partnerships are – in the broadest sense – connections between and among people and groups to share interests, concerns and create visions for the future. Historically, partnerships have been formed to educate, open discussion and address and solve problems among all parties involved and affected as well as stakeholders in all parts of the problems/issues and solutions. 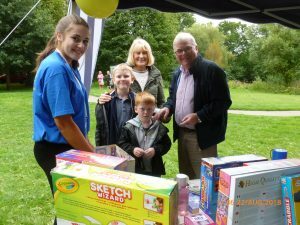 What is the Ponteland Community Partnership? 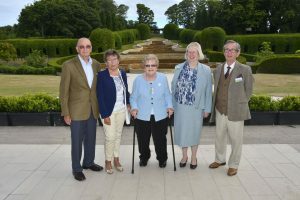 A group of like minded volunteers who also represent local groups or organisations who share a common idea to identify and improve the quality of life in Ponteland. 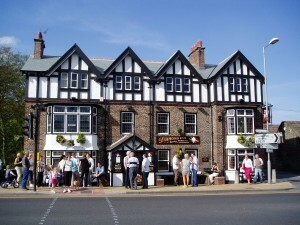 The Ponteland Community Partnership started in the early 2004 and was set up under the Local Government Act of 2000 at a time when Ponteland was part of Castle Morpeth Borough Council. Which organisations work with the Ponteland Community Partnership? 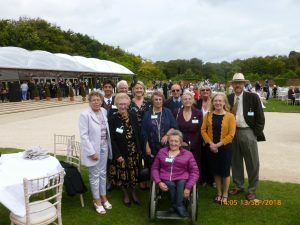 To identify activities and projects for those who live or work in Ponteland that will improve their quality of life no matter what their age. To access funding to provide for these activities or projects. Partnerships in the community abound in the professional literature of social work, adult education, and basic literacy education, religious or church work and among governing entities to name just a few environments. Partnerships are – in the broadest sense – connections between and among people and groups to share interests, concerns and create visions for the future. it is important to have a large number of people involved to inform, and buy-in to the process. Have an organisation or a structure to them.